Facebook, Twitter, Pinterest and Snapchat are the platforms that get most of marketers' love in the U.S., but digital practitioners could learn a thing or two from WeChat, China's booming mobile app that's one of a growing number of messaging apps brands are watching closely. The Chinese app boasts more than 600 million users, and some reports claim more than 50 percent of those users open it 10 times a day. While that still pales in comparison to Facebook's 1 billion daily global users, Tencent-owned WeChat has a tight grip on China's social and mobile industry compared with competitors like Line and Viber. "To give you a rough idea of what the social and advertising landscape looks like in China, it has over 600 million users and its closest competition would be more around 200 million users," said Thomas Graziani, co-founder of Chinese agency WalktheChat, which specializes in WeChat marketing. Adweek spoke with Graziani about how marketing and advertising works on WeChat, which has significant differences from U.S.-based platforms. To grasp WeChat as a marketing platform, it's important to first understand how the app works and why people use it. In the U.S., the average smartphone user opens a handful of apps every day to text friends, check email, use social media and take pictures. In China, WeChat is all of those apps rolled into one and is sometimes the only app consumers use. There are two options for building a brand following on WeChat: a subscription account that lets brands push out one message per day and a service account that caps the number of brand messages to one a week. Both require setting up an account. With subscription accounts, brands can push out consistent messaging, which WalktheChat recommends for marketers that already have a strong content-marketing strategy. Service accounts, on the other hand, reach more people but can't be used as often by marketers. According to Graziani, these accounts are better suited for brands that want to do more than use the platform for branding—including e-commerce and customer service. In either case, it's hard to break through the clutter, and the app requires brands to act more like users than marketers. "Because people spend all their time on it, it's extremely competitive to get attention from people," Graziani said. "The platform is not making it easy for brands to reach users." Similar to how digital marketers approached Facebook years ago, brands strive for a lot of followers because WeChat is a numbers game. "Our customers want members—we really care about number of followers," Graziani said. With that in mind, it shouldn't be surprising that advertising isn't a big push for WeChat's parent company, Tencent. Instead, the app rakes in revenue from payments. Graziani said Chinese e-commerce giant Alibaba is a bigger competitor for WeChat than other messaging or social platforms. "They are much more focused on looking at payments, which enables them to actually drive revenue from users making purchases through the platform," he said. According to Graziani, WeChat makes roughly 15 percent of its revenue from ads. Compare that with Facebook, which pulls in about 90 percent of its money from advertising. Still, there are advertising opportunities with WeChat depending on which type of account brands have. For subscription accounts, they can run banner-like placements along the bottom of their messages. However, smartphone-size banners perform just as poorly in China as they do in the U.S.
"These ads kind of work, but the clickthrough rate is so low that we don't recommend them to our customers," Graziani said. Then there are service ads, called WeChat Moments, which recently opened to all brands after a small rollout to a handful of accounts in January. The news feed-style ads look similar to Facebook sponsored posts and run in between pieces of content. According to Graziani, the ads initially cost about $800,000, but WeChat has since lowered the price to around $30,000. Marketers can target Moment ads by age, location, gender and device type. Graziani expects WeChat to roll out better targeting tools soon so brands can buy ads against specific interests. 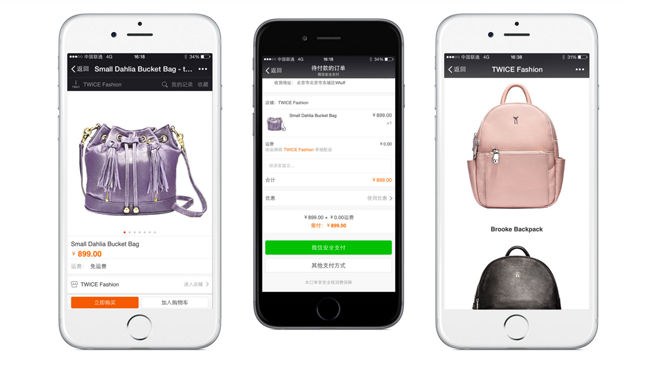 Given its size and potential, most brands eye WeChat as a massive opportunity except for luxury brands that want to maintain an elite image. E-Commerce is still a growing area for luxury brands in the U.S., too. "Luxury brands have a tendency to shy off e-commerce," Graziani said. "Brands like Louis Vuitton are going to use it as a branding platform." At the same time WeChat's ad business is evolving to look more like Facebook's, Graziani believes Facebook is beginning to look a little like WeChat, becoming a content hub for brands. Indeed, Facebook is slowly turning its Messenger app into a customer-service portal that lets brands like Everlane talk with individual customers. Earlier this month, the Menlo Park, Calif.-based company opened up its API that lets brands plug the app into their websites as a chat tool. "You can already see that happening if you look at the way that Facebook announced that they're going to have Facebook Messenger for business," Graziani said.